Rapid development of flexible electronic devices is promoting the design of flexible energy-storage devices. Lithium-sulfur (Li-S) batteries are considered as promising candidates for high energy density energy-storage devices. Therefore, flexible Li-S batteries are desired. 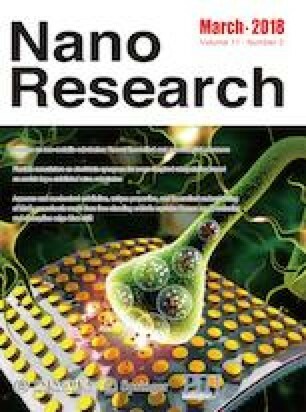 In this study, we fabricated composite films of freestanding reduced graphene oxide nanotubes wrapped sulfur nanoparticles (RGONTs@S) by pressing RGONTs@S composite foams, which were synthesized by combining cold quenching with freeze-drying and a subsequent reduction process. These RGONTs@S composite films can serve as self-supporting cathodes for Li-S batteries without additional binders and conductive agents. Their interconnected tubular structure allows easy electron transport throughout the network and helps to confine the polysulfides produced during the charge/discharge process. As a result, the RGONTs@S composite films exhibited a high initial specific capacity, remarkable cycling stability, and excellent rate capability. More importantly, the RGONTs@S composite films can serve as electrodes in flexible Li-S batteries. 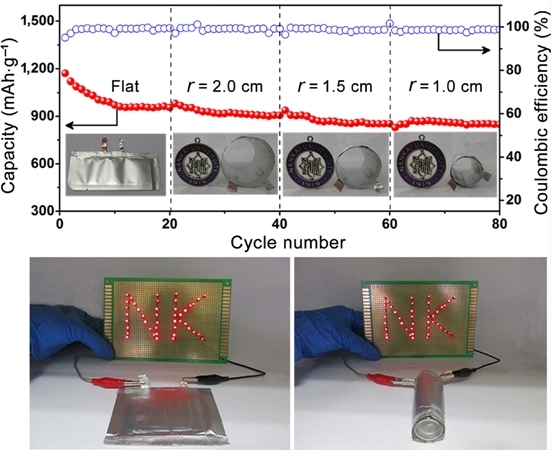 As a proof of concept, soft-packaged Li-S batteries were assembled using these electrodes and they displayed stable electrochemical performance at different bending states. Supplementary material (TGA curves of pure RGONTs and RGONTs@S composite films, SEM images of pure RGONTs, SEM image of RGO@S mixture, high-resolution XPS spectrum of C1s region of RGONTs, CV curves of Li-S battery based on RGO@S mixture, discharge/charge profiles of RGONTs@S composite film, the equivalent circuit model of Nyquist plots, the first discharge/charge profiles at 0.1C of RGONTs@S composite, rate performance and cycling performance at 1C of RGONTs@S composite films, Nyquist plots of RGONTs@S composite films, cycling performance with Coulombic efficiency of RGONTs@S composite films at 0.1C, schematic of different bending states, and table of impedance values) is available in the online version of this article at https://doi.org/10.1007/s12274-017-1749-2. This work was supported by the National Natural Science Foundation of China (NSFC) (Nos. 21573116 and 21231005), Ministry of Education of China (Nos. B12015 and IRT13R30), and Tianjin Basic and High-Tech Development (No. 15JCYBJC17300). Z. Q. N. thanks the recruitment program of global experts.